GERMBLOCK quality begins with a computer controlled, fully automatic manufacturing system that regulates everything from bulk silo storage of raw materials, to blending, conveying, molding, trimming, packaging and scrap recovery. This process helps to ensure consistency in weight and wall thickness. GERMBLOCK are the strongest, most durable balls available and they retain resiliency longer than other balls on the market. UV and antioxidant protection against fading and cracking ensures that GERMBLOCK will stay bright and colorful for a long time to come. 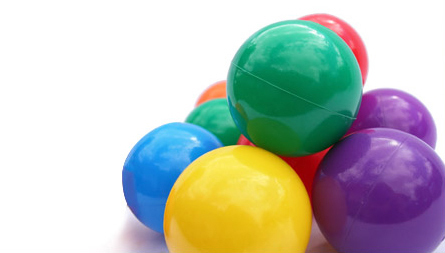 The balls are sterilized in the manufacturing process and most color pigments used are FDA approved. Their quality has set the standard in the industry. There are over 100 million GERMBLOCK in play worldwide! Independent laboratories tests confirm GERMBLOCK do not split or break in normal use. Production line samples are randomly selected and compressed to 50 percent of their diameter 10,000 times to assure quality standards are met. GERMBLOCK are molded from a proprietary formulation of polyethylene plastics with antioxidant and ultraviolet inhibitor additives that give them strength, weatherability and longevity. Because of these materials, balls are fade and crack resistant. GERMBLOCK quality is consistent because of the manufacturing process. A unique manufacturing procedure was designed specifically for GERMBLOCK. This ensures uniformity and consistency in weight and wall thickness, which with material formulation are the keys to quality. GERMBLOCK are molded from nontoxic materials with smooth parting lines and no sharp edges to scratch or cut tender skin. GERMBLOCK are sterilized at over 280°F in the manufacturing process and nearly all colors are FDA approved. *See Special News below. GERMBLOCK are inventoried in 12 standard colors that appeal to children. Balls are also fade and crack resistant to stay looking vibrant for a long time to come. Significant inventories in all colors are normally on hand and factory orders for standard colors are generally shipped within three days of the order. GERMBLOCK can be customized! One of our customer service representatives will be glad to assist you in choosing a special color and/or add your logo to the balls. All of this can be done at a reasonable, additional cost. Simply contact us by email or phone. GERMBLOCK customers can use and or sell Intertech balls with certified assurance they are in compliance with all federal safety requirements. GERMBLOCK may be the safest ballpool balls on the market world wide in addition to highest quality and longevity. Laboratory tests confirm that GERMBLOCK last on average 5-10 times longer than less expensive imports from the Orient of similar size and appearance.